"I can say this: It's true that Rob sent an e-mail to Steve," RealNetworks Vice President, Corporate Communications, Greg Chiemingo told MacCentral. "Certainly some of the things [in that e-mail] are consistent with what we've said before -- that Apple should open up the iPod." "Das im RealPlayer Music Store eingesetzte Audioformat setzt ebenfalls auf dem herstellerunabhängigen MPEG-4-Audiostandard AAC (Advanced Audio Coding) auf, verwendet aber einen anderen DRM-Schutz. Um real gekaufte Musik auf dem iPod wiederzugeben, müsste Apple grundsätzlich also nur das DRM-Format von RealNetworks in die Firmware flicken. Für Rio Audio kommt das Problem aus der Gegenrichtung: Der Hardware-Hersteller würde ja gern das von Apple eingesetzte DRM unterstützen, doch lizenzieren die iPod-Macher das Format nicht an Dritte. Rio Audio bemüht sich seit Mitte 2003 vergeblich darum, das iTunes-Format nutzen zu dürfen." Apple UK bewirbt Jobs im anstehenden Londoner Apple Store. "Jobs is different from most of his peers in that he takes personal responsibility for what Apple makes and how those products feel to the user. Jobs directs the design process from start to finish, asking endless questions, expressing often conflicting opinions, unfailingly pushing the company toward better, more useful products. The sort of decisions that at most companies are considered finishing touches--the color of a computer case, the look of a hinge, the sound a product makes when it is opened or closed--are to Jobs the very heart of the user experience and so are at the core of the design process. Michael Dell doesn't do it that way, but then Michael Dell knows he is no Steve Jobs." "There is something thrilling about setting the player on Shuffle and letting it decide what to play next," Ross writes. "The little machine often goes crashing through barriers of style in ways that change how I listen." Genau richtig zum Wochenende: Desktop Golf unter OS X bei JD3. "One of the problems is ongoing yield issues within the company's 300-mm fab in East Fishkill, N.Y. For months, IBM has been struggling with yields in the fab, a 130- and 90-nm plant. "We do see demand, but we need to make the products," Joyce said. "We need to improve our yields in our 300-mm plant. Our yields did see some improvement, but not as fast (as the company had hoped)." "I'm a big fan of "if you don't like it, do something better." I believe that PulpFiction is that "something better." It's better for me, anyway, and it may be better for you. Yes, PulpFiction is an aggregator of XML feeds. Its top ten features, in my mind, are as follows." Die Feature-Aufzählung hört sich zumindest interessant an, mal sehen inwieweit man gegen die zukünftige NNW Version 1.1 ankommen wird. "According to sources, Belkin and Apple are currently working together on a number of iPod accessories that will 'seem revolutionary' to iPod owners. The new accessories should be announced within the next three months." "...bis die eine sagt: »Der Apple (der Ebbl) macht auch Computer.« Echt? fragt die andere, um dann zu überlegen ... Computer? Richtige? Wie der Bill Gates?" "This favelet will prompt you for a string of characters to find on a page and then highlight all of the ones it finds in yellow." "Calpers, der Pensionsfonds der Staatsangestellten des US-Bundesstaats Kalifornien, wirft dem Aufsichtsrat von Apple Verstöße gegen gute Firmenethik vor. Calpers besitzt 1,48 Millionen stimmberechtigte Aktien; insgesamt sind rund 367 Millionen Apple-Aktien im freien Handel, der größte institutionelle Anleger hält 36,9 Millionen Aktien, Apple-Chef Jobs besitzt rund 5 Millionen Anteile." Bei heise. "The purpose of this article is to introduce you to a few methods to keep your data synchronized between multiple locations. First, we will discuss iSync and what it does and doesn't synchronize. Next, we will cover iDisk and what it entails. Finally, we will wrap up with a discussion of an application from Econ Technologies that promises to keep your data synchronized with very little effort. Let's get started, shall we?" Playfair wurde von seinem neuen indischen Server ebenfalls von Apple verbannt. Während wir gespannt sein dürfen, wie die Zahlen des iTMS zum anstehenden 1jährigen Jubiläum Ende April aussehen werden, äußerte sich Apple Europa Chef Pascal Cagni gegenüber Reuters zum Verbleib der europäischen Spielart: "When we launch in Europe, we want to do it well. There can be no compromise on the ease of use, the depth of the catalog or the responsiveness (of the Web site)," Apple's European chief Pascal Cagni told Reuters in a telephone interview. He added that a delay of a few months was acceptable because the store was going to be an important outlet for many years. "This is going to be so important for the future that a few months' delay is not essential," he said. "But it will come. Absolutely," he added, when asked if he was sticking to the launch target year of 2004." "Apple had planned to introduce iTunes in Europe during the first quarter of 2004, but it delayed inaugurating the service because negotiations with national royalty agencies are taking longer than expected, said the London-based European Digital Media Association, which represents companies that offer music online. In the meantime, Apple, which has not filed for a license to begin its iTunes online service in France, is being assessed a fee on its iPod because the player is considered a copying device, said Thierry Desurmont, vice president at France's national collection agency, the Society of Music Creators, Composers and Publishers. Apple has so far refused to pay an estimated E20, or $24, levy on every iPod it has sold in France. the society is threatening to go to court to force the company to pay." "Seattle-based RealNetworks said Thursday that Apple chairman Steve Jobs had rebuffed an offer by RealNetworks' chief executive Rob Glaser to meet and discuss forming an online music alliance involving Apple's best-selling iPod portable players. In an interview earlier this week with The Wall Street Journal, Jobs said Apple has little incentive to open its popular digital music player to others. "The iPod already works with the No. 1 music service in the world, and the iTunes Music Store works with the No. 1 digital-music player in the world," he said. "The No. 2s are so far behind already. Why would we want to work with No. 2?" "Glaser also trusted Jobs to remain discreet about the offer. What was he thinking? Putting a revolver on the table while you offer terms may work in Tony Soprano's world--but not in Silicon Valley. In Jobs, Glaser faces an executive with an ego even bigger than his own. "You gonna' mess with me? No, I'm gonna' mess with you!" Worse, Glaser's gun had no bullets. The Listen.com digital music service RealNetworks operates sells subscriptions. But at the San Francisco debut of the iTunes store a year ago, Jobs scoffed at the assumption that people want to rent and not own their music. Given the history, you can understand why Glaser's offer has left Apple underwhelmed." "RealNetworks, in particular, would appear to bring little to the party. 'The only way RealNetworks has a chance to become involved to a greater extent is if users express dissatisfaction over their ability to use other services with iPod, and we certainly haven't heard much about that yet,' said NPD Techworld analyst Stephen Baker. 'I don't see a tremendous amount of advantage to licensing Fairplay,' said David Card, an analyst at research firm Jupiter Research. 'Apple is a hardware company, and the only reason Fairplay, or even iTunes for that matter, exists is to sell and promote iPods,'" Fried, Shim and Hines report." "We feel great," Steven P. Jobs, Apple's chief executive, said in an interview. "We sold a lot of Macs, but we've sold more iPods in the quarter than all the Macs put together." Die Details zum Conference Call ebenfalls im fscklog. "Der Computer-Konzern Apple ist in Deutschland vor allem wegen des Erfolgs des Musikplayers iPod euphorisch gestimmt. "Ich bin durchweg optimistisch", sagte Deutschland-Chef Frank Steinhoff am heutigen Donnerstag der dpa. Im abgelaufenen Quartal sei das Geschäft hierzulande ähnlich erfolgreich gelaufen wie im Rest Europas." "One dealer reported being told that the commercials had to be removed due to expiring music rights. Apple's directive has prompted speculation that the company is planning changes or a revamp to its iPod advertising efforts, but sources had no specifics or hard information on future marketing plans." "When blogging, many people show much more of themselves than a picture can describe. But reading something can't substitute viewing peoples environment. Since I'm a quite curious person, I'd like to SEE where people work to be able to get a better impression of them and their work. Partly I was inspired for this site when the Meme-pics came up in the blogging-scene. I also found a few sites which already are showing desks/computers of other people. But one isn't online anymore, the other one is in connection to a board with too many text and the last one is the opposite of what I'd like to provide here, a clean picturing of working space." Reichliche Zusendungen an 'submissions at ipeep.vactory.de' werden sicher gerne entgegengenommen und einen RSS Feed gibts natürlich auch. "But in a way, the controversy over Apple's use of SPEC benchmarks, the discarding of the "fastest computer" claim and the adoption of new tests may call into question the idea of benchmarks themselves rather than Apple. A computer is a system of components that work together. The CPU, RAM, data bus, hard drive, operating system and video card must work together to produce today's blazing speeds. Any one of those components can drag down the overall speed of a system. Simply measuring a single component tells very little about the system's total performance. Maybe instead of asking which computer is the fastest, people should ask which is the most useful for what they want it to do." "Apple Computer Inc. is seeking Common Criteria evaluation of Mac OS X, which could open government doors wider to open-source software. That means other open-source developers could incorporate the evaluated elements in their software." "So a good strategy might be to revamp the .Mac service, with Gmail as the e-mail underpinning. Let Google do the heavy lifting, and Apple can share the revenues from ads served to the e-mail messages. (For those concerned about privacy from Gmail's controversial content scan, Apple could offer an opt-out and charge slightly more for the privilege.) Then, Jobs & Co. should evaluate whether the various remaining pieces of .Mac offer real value or need a refresh." "Yes, Gmail might draw users from Yahoo and Hotmail, but is does it really constitute a threat to .Mac? I don't think so." "According to the usual suspects, Apple's announcements at the NAB 2004 conference will focus on advancements in professional video and sound software, rather than new hardware. Along with an already confirmed introduction of Shake 3.5, sources said to expect multiple "Pro" software updates, including a revised Final Cut Pro. One of the most interesting rumors is that Apple plans to unfold a new technology into a new "Pro" application or extension of Final Cut Pro. Details are very vague, but over the last several months sources have described a software-based asset management system for video (and possibly sound) clips — a souped-up iPhoto of sorts, designed for Final Cut professionals working with video." "Aspyr today announced that its Mac version of Tom Clancy's Splinter Cell has hit beta. The strategy and spy game is now available for pre-order at $50. Aspyr also released an update to Command & Conquer Generals Mac Demo that fixes stability issues with some ATI Radeon video cards (in particular 9000 models), addresses multiple monitor cursor controls, and increases performance of in-game movies." DL-Link (2,4 MB) für C&C Demo Fix. "A personal note: Norton Utilities for the Macintosh (which was originally called Symantec Utilities for the Macintosh or SUM) is one of the oldest Mac utilities still on the market. Over the years, Symantec maintained its dominance in the repair utilities field partly because Norton Utilities was simply a very good product and partly because Symantec acquired (and thus eliminated) competing products (such as MacTools and Public Utilities). However, with the release of Mac OS X, Norton Utilities began to decline. There were frequent compatibility problems as well as a very un-OS X-like installation procedure (that placed Norton files in numerous obscure locations around the drive, making it difficult to uninstall the software). Postings on Web forums often complained that running Norton was more likely to harm a drive than fix it." Apple zahlt bereits an Apple Corps. "Apple executives would not comment on the message. But it seems likely Mr. Jobs will rebuff the offer. Mr. Glaser said he had not received a response from Mr. Jobs, and in his e-mail message Mr. Glaser said he was going to be in Silicon Valley this week and suggested that he meet with Apple executives today." Glaser hat bereits öffentlich Apple aufgefordert, dem iPod das Abspielen von WMA zu ermöglichen. Kaum hat sich die Quartalszahlen Attacke gelichtet, fährt AppleInsider 'makellose Quellen' auf, die für nächste Woche sowohl neue iBooks wie auch neue PowerBooks versprechen. Leider steht in dem Artikel nicht viel mehr als Modellnummern: "According to sources, Apple is expected to announce the new portables simultaneously on Monday, April 19th. All models are said to feature faster G4 processors and improved graphics capabilities." "Taiwanese distribution sources have indicated that a number of iBook and PowerBook configurations are currently in air-transit to US distributors. Additionally, multiple sources have now confirmed a majority of the Apple product numbers listed for the new laptops in an earlier report. According to an unconfirmed tip, among the many configurations planned for release are a 12-inch 1GHz G4 iBook equipped with a 30 GB hard drive, 256 MB RAM, and a Combo Drive. The low-end 14-inch iBook model will reportedly pack a 1GHz processor, 40 GB hard drive, 256 MB RAM, and Combo Drive." "There is a 1.5 GHz chip. And also a 1.42 one. If Apple keep shipping its laptops with G4, no doubt those CPUs will be inside the new Powerbooks." "The company will unveil new PowerBook and iBook models next week, reliable sources said, though exact specifications and feature sets are unclear. However, sources solidly contended that Apple plans to announce the new laptops on Monday. Despite varying announcement dates spreading across the web, sources confirmed the Monday, April 19 date." Letzter Conference Call mit Apples CFO Fred Anderson, der im Juni in Rente geht und von Peter Oppenheimer genachfolgert wird. Bestes Q2 seit vier Jahren. Apples Aktie stieg aktuell im nachbörslichen Handel um 4% auf 27,73 Dollar. Wer selbst ein wenig schmökern will, Mitschriften finden sich bei MacDailyNews, MacCentral, MacMinute und MacNN. Der weltweite Umsatz lag bei 1,91 Milliarden US Dollar (29% über dem Vorjahresquartal), der Gewinn belief sich auf 46 Millionen Dollar und damit 12 Cent pro Aktie (Vorjahr: 14 Millionen Gewinn, 4 Cent pro Aktie). Europa konnte mit 449 Millionen Dollar ein knappes Viertel des Umsatzes für sich verbuchen (33% mehr als noch im Vorjahr). Die Stückzahlen wuchsen zum Vorjahr um 4%. Insgesamt wurden 749.000 Macs verkauft, 5% mehr als im Vorjahresquartal, allerdings 10% weniger als im zurückliegenden Quartal. Besonders erfreuen konnte nur das iBook mit rund 50% Zuwachs an verkauften Stückzahlen und Umsatz zum Vorjahresquartal. Enttäuschend hingegen die Zahlen für die Power Macs: 174.000 Stück sind eindeutig zu wenig und klar hinter Apples selbstgesteckten '200.000 pro Quartal'-Ziel. Bleibt zu hoffen, dass sich dies im aktuellen Quartal mit lieferbarem Xserve G5 und der mehr als ausstehenden Rev. 2 der Power Macs wieder normalisiert. Freude bereiteten jedenfalls die Zahlen beim iPod: 807.000 Stück in drei Monaten, erstmals mehr als ausgelieferte Macs, 909% mehr als im Vorjahr und immerhin 10% Zuwachs zum zurückliegenden Quartal. Bemerkenswert ausserdem: Apple ist schuldenfrei und besitzt 4,6 Milliarden Dollar Barreserve. 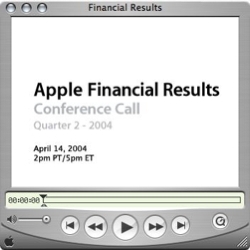 Zur Erinnerung: Nach Börsenschluss wird Apple heute seine Quartalszahlen für Q2/04 bekanntgeben, gefolgt vom Conference Call, der dann ab 23 Uhr live übertragen wird. Morgan Stanley äußerte sich gestern recht positiv und erwartet einen Umsatz von 1,82 Milliarden Dollar, hauptsächlich durch gute Verkaufszahlen bei iPod, OS X 10.3 und den iBooks, wohingegen der Power Mac G5 Abverkauf angeblich Stirnrunzeln aufwirft, vohergesagt werden zumindest nur 181.000 Stück (Apples Ziel liegt bei 200.000 pro Quartal). "Apple retail stores 'Ala Moana' in Honolulu, Hawaii and 'Twelve Oaks' in Novi, Michigan, ranked atop a list of company stores who met or surpassed their CPU sales goal for the second quarter of fiscal 2004. The two stores surpassed their sales goal by 140% and 147%, respectively. Stores 'The Westchester' in White Plains, New York, 'Crossgates' in Albany, New York, and 'King of Prussia' in Pennsylvania rounded out the top five. In all, nearly 6 dozen stores met their quotas. Part time employees of these qualifying stores will receive a $500 bonus for the quarter, while full time workers take home an extra grand. Unlike the previous quarter, an iPod sales goal was not in affect." "He added, "Apple has done a very good job of showing how easy it is to do all the things you would expect on a computer. Even if there's a bit of premium, we're still seeing a lot of interest in the software side of things. They're doing their best to meet the [low end] price range, but the bottom line is that what's bringing people to the Mac platform is the integration application and user interface for ease of use." Roger Kay agreed, saying "I think the idea is that Apple has always positioned the Mac as a premium product. They think there is value in that they can charge for." Seit einer Woche ist klar, dass die Apple vs. Apple Corps. Klage in London ausgetragen wird, nun berichtet The Register, dass Apple natürlich die Möglichkeit hätte, gegen die Entscheidung Einspruch zu erheben, sich dabei allerdings bereit erklärte, die Kosten des Beatles Labels Apple Corps für die Anhörung zu übernehmen und umgerechnet rund 150.000 EUR bis zur endgültigen Einschätzung der Verfahrenskosten jetzt schon zu zahlen.